Welcome Offer: Get 5% cash back†† on eligible gas and grocery purchases for the first 6 months (until the total gas and grocery purchases in the applicable month reahces $500). Earn 2%‡ thereafter. Take advantage of a card that provides Cash Back on eligible purchases. 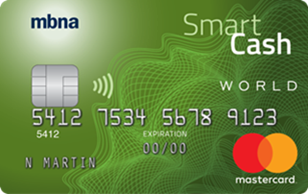 Apply now for the Smart Cash® World credit card.